Click on homes for sale in Allendale for the active listings of houses, duplexes and condos for sale in this neighbourhood in the University of Alberta area of Edmonton. So far in 2015, the average selling price for a home in Allendale has reached $476,343. Comparing that to 2014, the average sold price in Allendale was $396,998. 2015 has been helped by a sale of $740,000 this year, that has helped bring up the average selling price. The most affordable home in Allendale in 2015 has sold for $300,000. These average sale price stats above are calculated on a single family detached home sale; the other property classes such as duplexes or condominiums are not included in these average selling price statistics. On average it takes 40 days to sell a home in Allendale in 2015. That is the same as the Edmonton average days on market of 40 days this year. In the duplex / townhouse real estate market in Allendale, the average sold price for a duplex this year has been $518,750. On average it is taking 53 days to sell a duplex in Allendale. Infill duplexes continue to make a larger share of the market in Allendale. 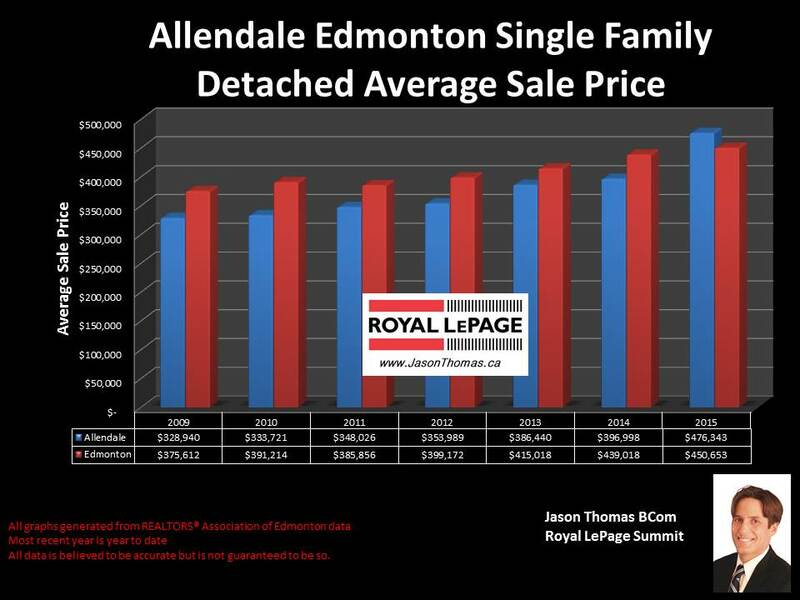 To view graphs on other Edmonton neighbourhoods visit Edmonton Home Selling Prices by Neighbourhood.